Last night, while looking at the Facebook history between me and a good friend, I noticed a couple of comments we messaged to each other a few years back that referred to some posts on my old blog. I launched it in 2003 when such things were set up as online journals used by individuals for free expression, not as the structured social media business outlets that we have today, and for several years, I updated it regularly. Since my last post on there in 2009, however, life has kept me pretty busy with working and all, and I’ve totally fallen out of the habit. I started that blog as a simple outlet where I could write out whatever was on my mind, and I kept it for years primarily for my own benefit. In looking at it last night, though, it really hit me how I don’t write like I used to anymore. I mean, sure, I write — my job as a magazine editor means I write on a daily basis, and often about topics I really enjoy. Since high school, I have worked hard to be able to combine my passions for writing, travel and outdoor recreation into a meaningful career I loved, and I’ve been fortunate enough to have gotten full-time work in which I can do just that. However, the kind of writing that really gets my juices flowing is the kind of stuff I put on my old blog, which was such an important creative outlet for me from high school through college and beyond. While I was traveling around the world for 100+ days in the spring of 2008, I kept a daily journal of my adventures that I posted in chunks as often as I was able to get a decent web connection. 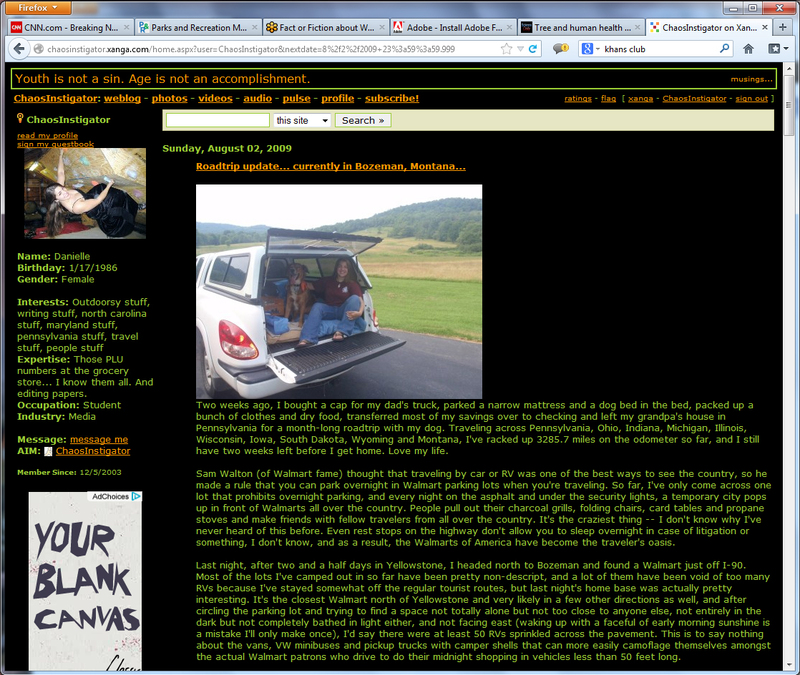 When I drove across the country with my dog during the summer of 2009, I wasn’t as good about keeping a daily record, but I regularly updated my blog from the road. I count these two adventures as some of the most formative experiences of my life, and by keeping a regular journal of my travels, I was able to more deeply explore their impact on me and really figure out what I thought and how I felt about what I was seeing, doing and learning. And even now, I still feel like I can relive the experiences and put myself back in those exciting times just by reading my old posts again. To me, that’s an even better way to revisit my memories than by looking at photos I took along the way. I don’t see travel or recreation or anything, really, that I get excited about as things to just check off a list and never look back to — to me, they’re integral parts of what make me who I am. And writing always helped me work out just who that is. Even better, the need to have something to write about probably prompted me to lead the more-interesting life I led in the past so I’d have something to write that someone might want to read, even if it was only the future Danielle Taylor. One lament my boyfriend has about our relationship is that neither of us are quite as regularly adventurous as we were before we met, especially given that our mutual interests in travel and the outdoors and learning new things were some of our main points of attraction toward each other in the beginning. Neither of us misrepresented ourselves when we were first getting to know each other — I had legitimately just been through two of the most exciting years of my life when we first met in 2010, and he was just coming off of his college years in Colorado where he regularly summited major mountains when he wasn’t flying down them on his mountain bike and got 50+ days on the slopes each winter. And we haven’t been totally boring since we met, either — we’ve traveled to Costa Rica, Bermuda and a number of U.S. states together, plus I just got back from a short trip to Mexico and he’s currently skiing in France. But it’s not the same as it was a few years ago when we regularly had the time to take advantage of more opportunities, so it’s easy to be lazy and never get around to the stuff we need to do to live life to the fullest and be who we want to be. My last post on here (several months ago…) was about how we come up with all sorts of excuses to not get out and do it, so I’m going to do my best to make the most of 2013. This year, in addition to working my way back to a healthier weight and making a significant dent in my credit card debt, I’m resolving to be more like the me of five years ago. That means finding a place to store my kayak in Virginia so I can use it a lot more often, not touching my travel savings account except for on trips, finding someone local to take care of my dog when needed so that doesn’t hold me back and writing, really writing, more regularly to keep my mind fresh. Five years ago today, I embarked on a trip around the world, and I want to get back to the mindset of constant adventure and good writing habits I had back then. We’ll see how it goes :). You will do great, and greater, things! And I look forward to reading all about them!! Thanks, Kate! I definitely want to hear about your adventures in Australia the next time I see you!